Zion Market Research has published a new report titled “Nanocellulose Market by Type (Nanofibrillated Cellulose, Nanocrystalline Cellulose, and Bacterial Nanocellulose) and by Application (Paper Processing, Composites & Packaging, Paints and Coatings, Oil and Gas, Biomedical & Pharmaceuticals, Electronics & Sensors, and Food and Beverages): Global Industry Perspective, Comprehensive Analysis and Forecast, 2017 – 2024”. 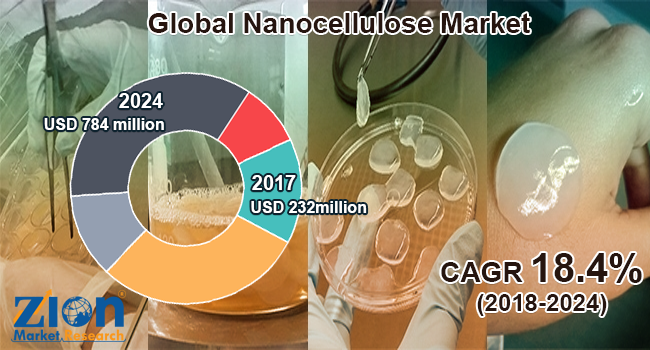 According to the report, global nanocellulose market was valued at approximately USD 232 million in 2017 and is expected to generate revenue of around USD 784 million by the end of 2024, growing at a CAGR of around 18.4% between 2018 and 2024. Nanocellulose is majorly used for the body armor, in flexible screens, bendable batteries, and ultra-absorbent aerogels among others. Increasing demand for the nanocellulose in a wide range of applications in different end-use industries such as oil and gas, food and beverages, paper processing, and personal care products is positively influencing the market growth. The rising number of manufacturers across the world are capitalizing on demand coming from different industries, particularly from the food & beverages and oil & gas. However, it is the lack of awareness regarding nanocellulose in the emerging countries and large investments required to scale up its production are the major factors anticipated to hamper the market growth. On the basis of type, the nanocellulose market is segmented into bacterial nanocellulose, nanofibrillated cellulose, and nanocrystalline cellulose. Nanofibrillated cellulose accounted for the major market share in 2017 and is anticipated to continue its dominance during the forecast period. Nanofibrillated cellulose gained traction due to its economic value, renewability, low density, better mechanical properties, and biodegradable-nature. The nanocrystalline cellulose accounted for the second largest market share in 2017 and known as microfibrillated cellulose. They are normally attained from the natural cellulose fibers that are renewable & biodegradable in nature. As nanocrystalline cellulose is less expensive than other types of nanocellulose, its usage is estimated to increase in the coming years. Based on the application, the nanocellulose market is divided into oil and gas, paper processing, paints and coatings, biomedical & pharmaceuticals, composites & packaging, electronics & sensors, and food and beverages. Food & beverages sub-segment within the application segment is projected to hold the largest market share in the upcoming years. The properties of the nanocellulose help in preventing the food content spoilage, thereby enhancing its shelf life and quality of food material. The electronics and sensors sub-segment within the application segment is projected to grow at the highest CAGR during the estimated timeline. The growing use of sensors in the industrial applications is predicted to drive the demand for nanocellulose in the electronics and sensors sub-segment. On the basis of geography, North America held the largest market share in terms of revenue in 2017. The growth in this region is attributed to the technological advancements and the presence of the major key players such as American Process Inc., CelluForce, FPInnovations, and Kruger manufacturing nanocellulose. The U.S. contributes to the overall market growth and holds a major market share as it is the largest consumer and manufacturer of nanocellulose. Europe is anticipated to be the second largest region followed by North America in terms of revenue. Increasing applications of nanocellulose in various end-use industries are supporting the nanocellulose market to grow in the upcoming years as well. Some of the key players operating in the nanocellulose market are Innventia, FPInnovations, American Process Inc., Melodea Ltd., Diacel FineChem, CelluForce, Nippon Paper Group Inc., UPM-KymmeneOyj, Stora Enso, J. Rettenmaire & Sohne GmBH (JRS), Kruger, Borregaard, Sappi Ltd., and Asahi Kasei Corporation.